What outside influences are at play here? We are not arguing in favour of development here. We are simply questioning the basis of this council’s decision making. One application involves Bentleigh, and the other Carnegie. Both are zoned RGZ, and both are within council’s lines drawn on a map that designate them both as being within the Urban Village structure. Yet, remarkably, the one in Bentleigh for 30 odd units receives the nod of approval and the one in Carnegie for ‘only’ 13 units is refused. Why? – when both are basically ‘compliant’ with the planning scheme? Secondly if the one in Bentleigh can be ‘fixed’ via the imposition of conditions, then why not the one in Carnegie? Even more disturbing is the absolute rubbish that we find in the Rocky Camera reports – inaccuracies, and blatant bias as evidenced in the following. We’ve drawn up a table so that readers can compare like for like. The Tranmere Avenue application also makes reference to Skyrail and the land’s proximity to the proposed rail line. The developer has submitted a noise impact statement for trains at ground level only. Given that no one knows much about Skyrail and its impacts, it is interesting to note that for Montgomery House application council granted a permit with the notation that should Heritage Victoria not rule in favour of retention, then a new application can be submitted. No such leeway was provided to Tranmere. An acceptable level of articulation has been provided for the development. The first floor is recessed behind the ground floor walls, with minor staggering of facades providing further articulation. Single garages are proposed ensuring that garages are not a dominant feature of the development. The dwellings have both been provided with ground floor, east-facing private open space areas of 58m2 and 87m2 respectively, in accordance with the requirements of the zone and Rescode. There are adequate landscaping opportunities at the front and rear of the site. Councils Landscape Officer has recommended that two canopy trees be planted in the front and rear yards of each dwelling (4 trees in total). Site coverage is less than 50%, which complies with Rescode requirements. Thus we get a page and a half report where practically every aspect of the planning scheme is met, plus NO OBJECTIONS TO THE APPLICATION. Yet, it still is put on the agenda for a council resolution. Why? When countless other applications are decided at officer level, why is this one granted the privilege of a council resolution? What factors are at play here? Why is council’s time being wasted on such an application when the agenda is already overpacked (a mere 721 pages for Tuesday night). Is this a case of someone knowing someone else? Or knowing what might eventuate a year or two down the track? Who is responsible for getting this onto the agenda and what are the real motives? My guess the reason for 2 x double storey in Barry St Bentleigh is that Council policy is to “discourage the siting of two storey or multiple storey dwellings at the rear of sites”. Until the MSS is changed [and the public was discouraged from reviewing the MSS at the community consultation sessions] maybe Council officers aren’t going to risk their necks one way or the other. 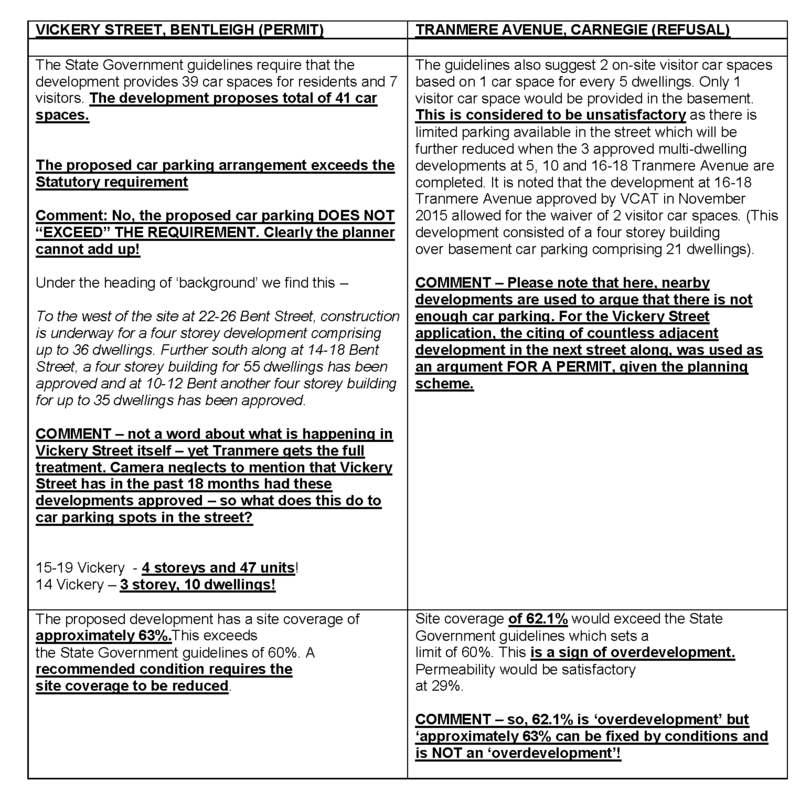 VCAT has in the meantime decided that Council’s policy is silly, and have ordered permits to be granted for 2 x 2-storey developments on conventional-sized lots. My understanding is that the application is for 2 attached dwellings rather than one behind the other and the one at the back being double storey. Plenty of such applications have got permits without going to a council meeting. My guess is that there is more to this than meets the eye or more than council or councillors are willing to admit. Good spotting. Shows decisions made first then scrounging around for anything to support no matter how stupid and incredible. Why indeed. Not even complying with the rules. What a farce. The treatment given to the Carnegie proposal is clearly different to the attitude taken to the Bentleigh one. Language used and facts omitted all contribute to the differences. This is unfair and I think very definitely biased and intended to justify a certain outcome. Council planners are supposed to be “objective” that means including the same information in both reports and using language that is non pejorative (“overdevelopment”) in equal measure. I don’t see anything changing until the time that officer reports include a checklist of ResCode requirements for every single application that show clearly if something is compliant and something isn’t compliant. I’m always surprised when some reports on applications include headings like “internal amenity” and others completely ignore this important aspect. If I was a developer then I’d head straight off to vcat very confident that I would get my permit based completely on the awful officer’s report and the lack of substance.